The GVEC Board takes its fiduciary responsibility to the membership very seriously, which includes managing the Cooperative’s financial resources in a prudent manner. 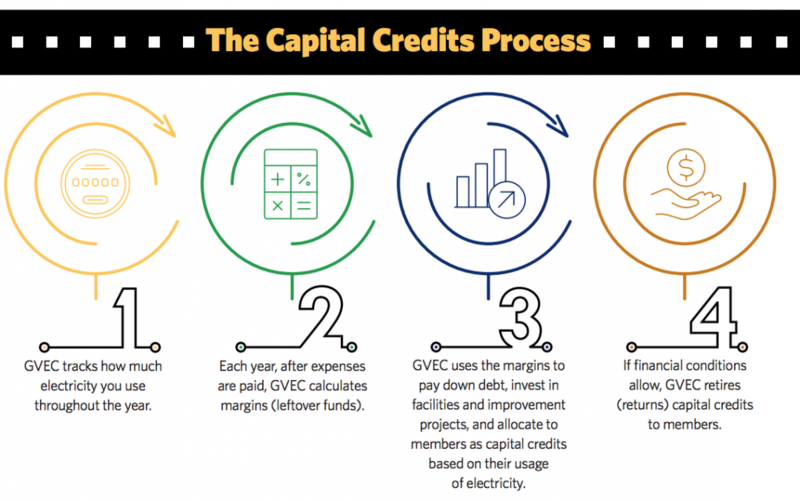 As financial conditions allow, GVEC’s cooperative form of ownership enables us to return a portion of the margins earned to members in the form of a capital credits refund. In July, GVEC will return $4.2 million in patronage capital to our member-owners, with $2.0 million going to members who had electric service in 2017 and the balance being distributed to members from previous years. If your capital credits refund is $75 or greater, you’ll receive a check mailed in July. If your capital credits refund is less than $75, you’ll receive a credit on your July electric bill. First, margins are used to pay down principal on debt. Margins are also used for investing in capital additions and improvement projects to ensure system reliability and to meet demands of growth. And as financial performance allows, margins are returned to members in the form of capital credits. This process helps keep the Cooperative financially stable and strong, while offering members the benefit of a refund whenever possible. It’s just one more benefit of being a co-op member!